A minor crisis occurred today when my nose ring fell out in the shower. Luckily I managed to get hold of it before it went down the sink – unluckily I wasn’t able to put it back in myself. Ricky finally convinced me to go back to the piercing shop and get them to fix it rather than me continue to attempt to bend it back into place with two opposing tweezers (as agonizing as it sounds), and luckily they sorted it in under three minutes. On the way back, to compensate for the trauma, Ricky took me out for bingsu. 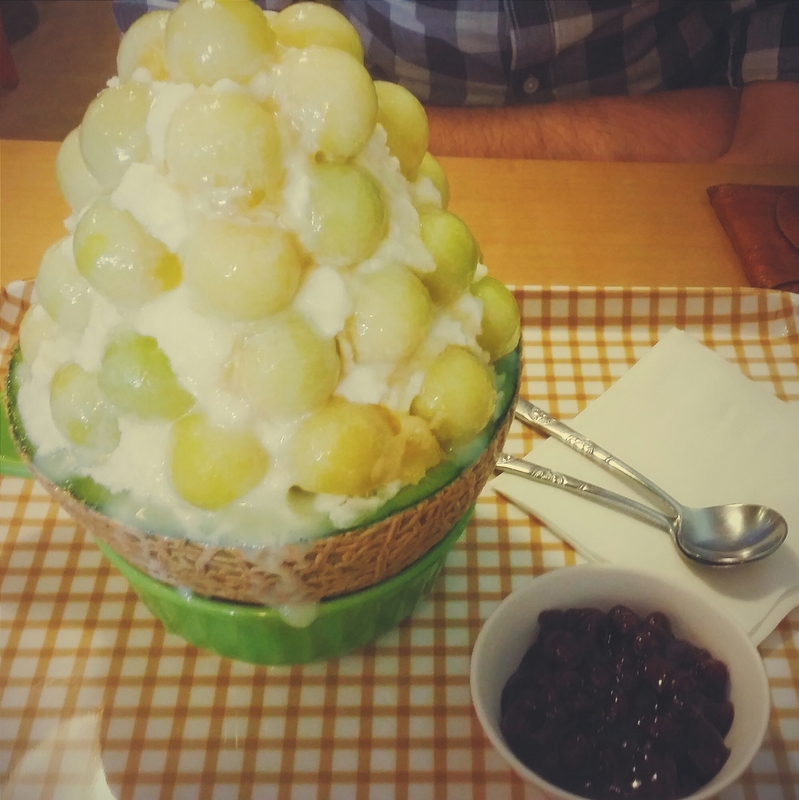 Now I don’t remember if I’ve talked about bingsu before, but it’s a traditional Korean dessert composed of shaved ice, red bean, a sweet syrup much like condensed milk, and then whatever fruity/chocolaty/wafery goodness you decide to have with it. The one we got happened to be the seasonal melon flavour served in the half scooped out bowl of melon rind. It was decadent and extremely refreshing on this hot and humid summer day. It also served as my lunch as I’d fretted too much about my piercing to be hungry earlier. I had a much more balanced dinner though: a few weeks back Ricky and I found salmon on sale, a rare treat. The fillets we bought were so fresh and red I wanted to cut it into sashimi right away. Alas, we froze it instead. Today however we threw together a sublime meal to finally enjoy this most precious of fish. 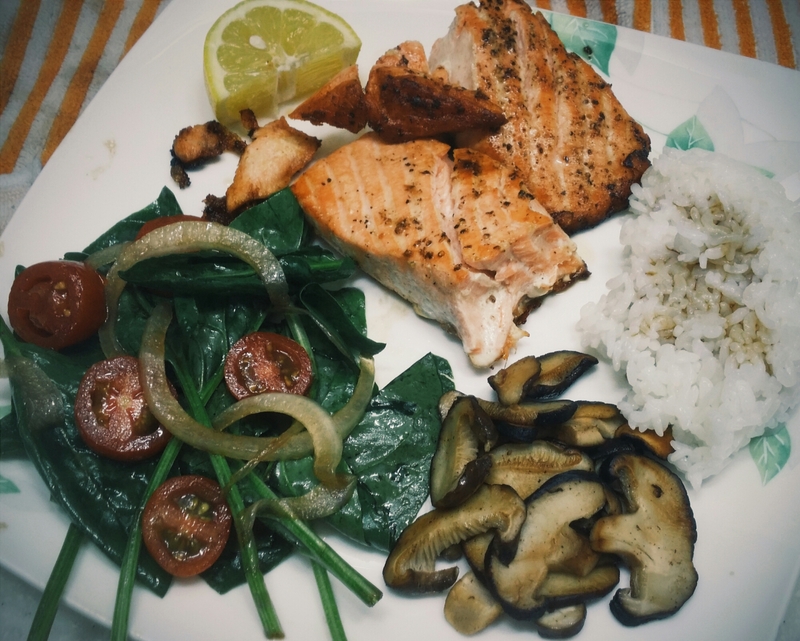 Skillet fried salmon seasoned with sea salt, pepper, and lemon with sides of rice, butter-sautéed mushrooms, and a salad of spinach, cherry tomatoes, and fine sliced onion tossed in balsamic vinaigrette. Definitely a day of eating like kings. I desperately want all this to eat right now! Beyond delicious looking!!!! Can’t wait till you cook me up food like this :D.
Thank you to Ricky for the wisdom of making a return trip to the piercing shop and a stop for a treat. Brilliant plan both ways. I can’t wait to cook for you! It’s something I’ve truly grown fond of in the realm of independent living.